The NightHawks gathered for their finale run at Parkland Green ahead of next weekend’ Sundown Marathon whilst the Kookaburras were just getting in their first 30km training run at Optimal Pace. 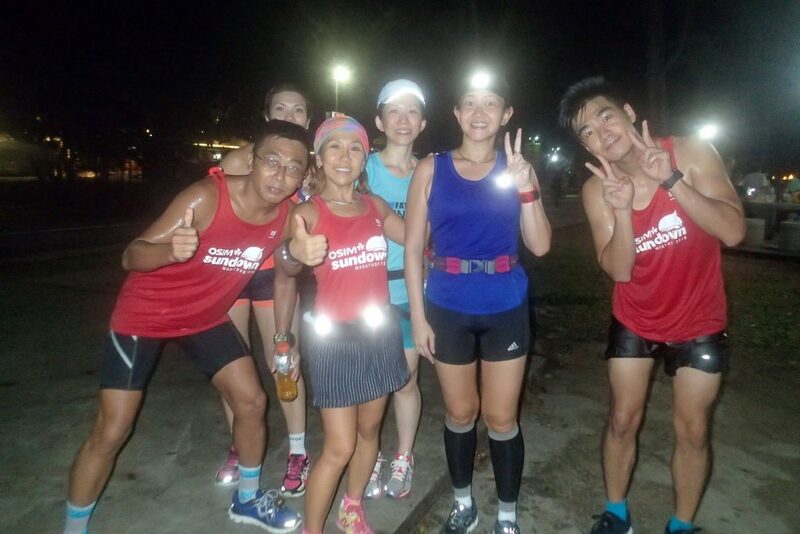 We had a special guest in the form of Aileen Ho, an avid marathoner with more than 100 marathons to her name and the newly published author of Around The World In My Running Shoes, who offered a glimpse of her content-rich marathon travelogue and a good deal for the FatBird runners present. 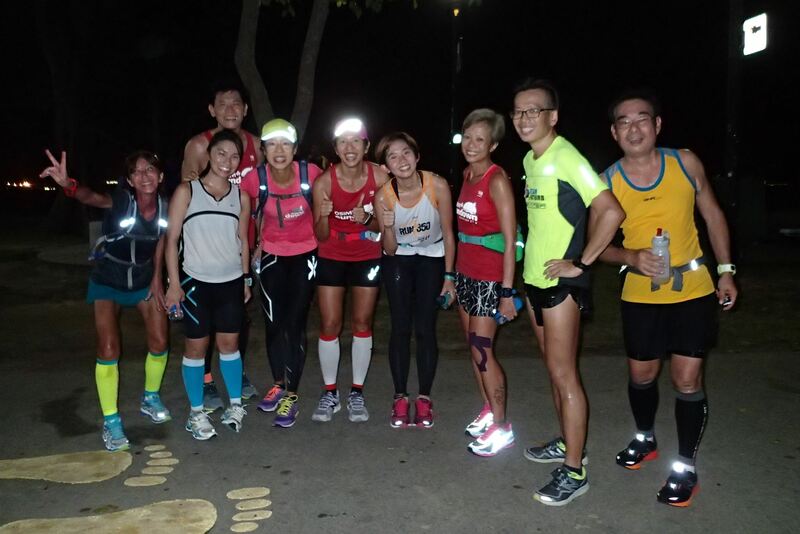 The night run started promptly for the Sundown Pacers, NightHawk and Kookaburra marathoners at 7:15pm and soon they were coasting at Optimal Pace along the lengths of ECP. The night was rather cool and because of the holiday, the crowds of families and holiday makers were out in full force, making the long run quite interesting for all of us. 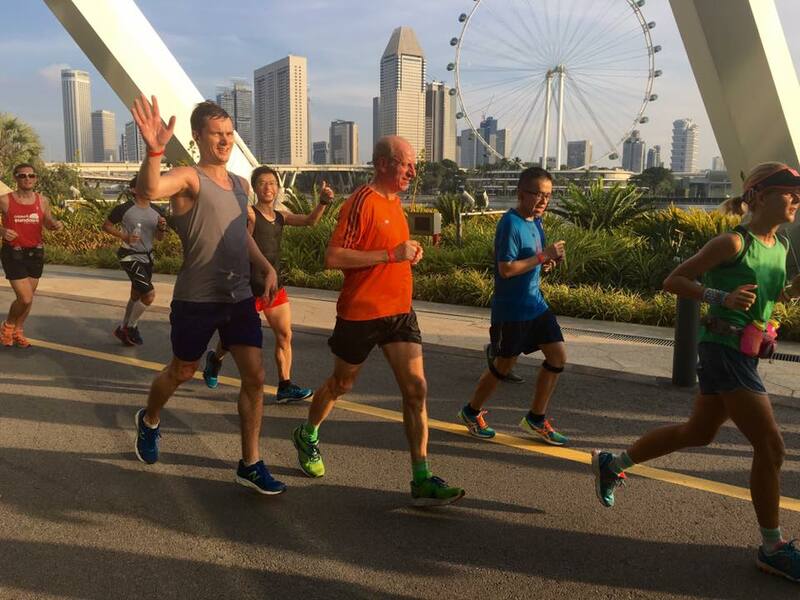 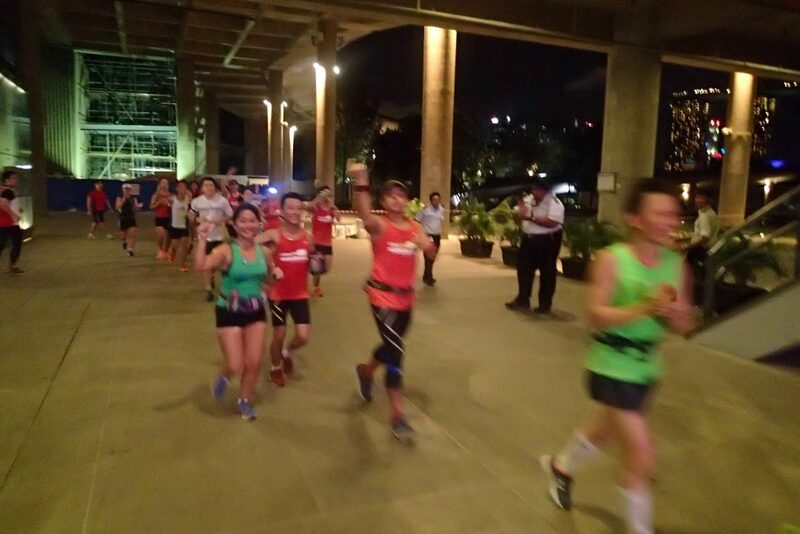 As it was a final trial for next weekend’s important Sundown Marathon race, all the Sundown Pacers and trainees took extra efforts to test out their sustained Optimal Pace as well as put their final preparations into action – a final rehearsal for the actual night. 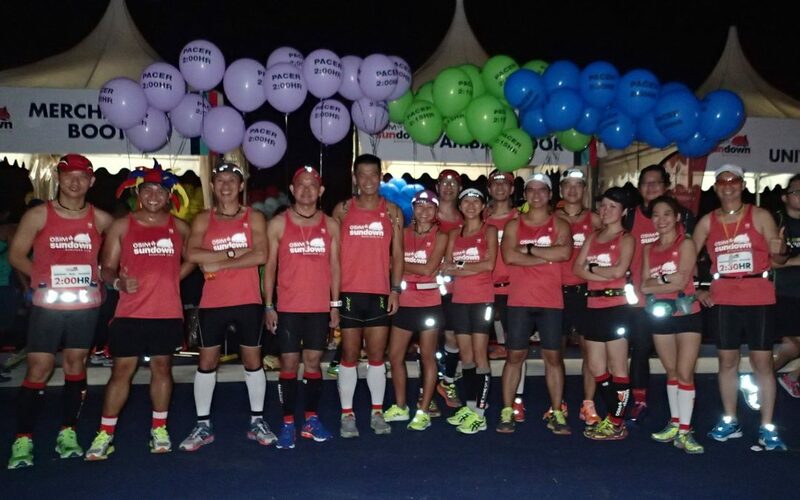 The NightHawks completed 13km (HM) and 18km (FM) strongly, with lots of reserves in their tanks, all set for the big race. 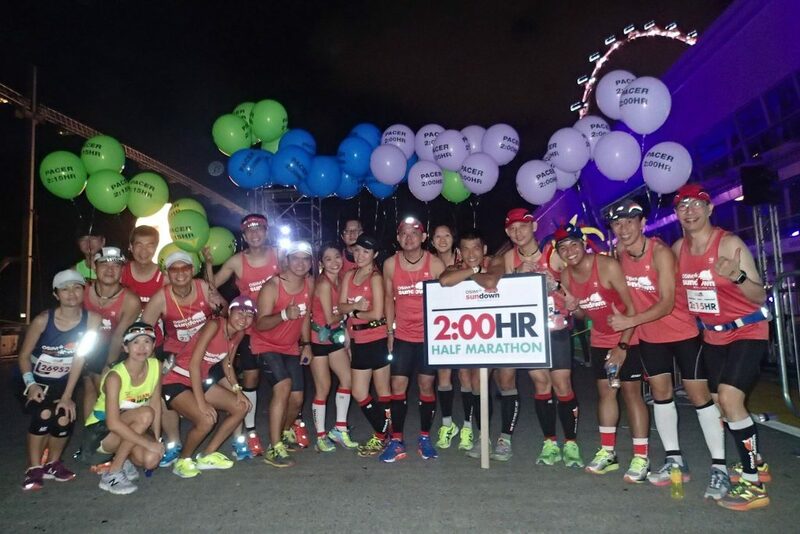 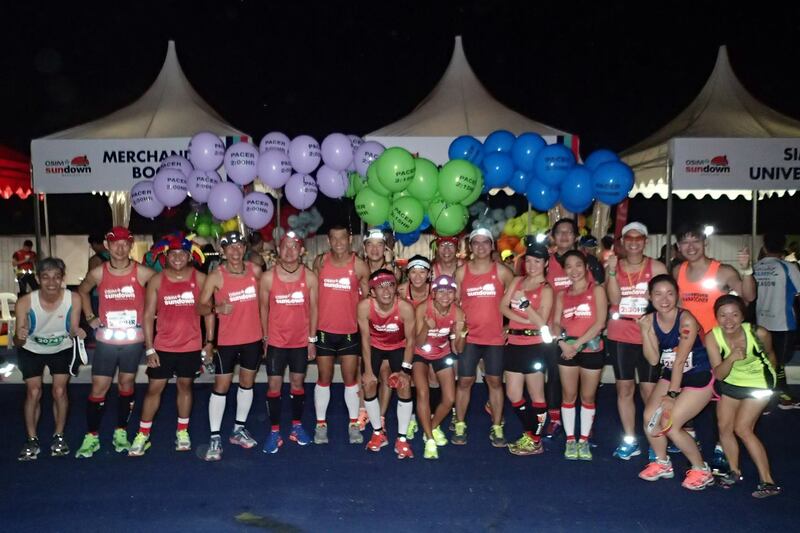 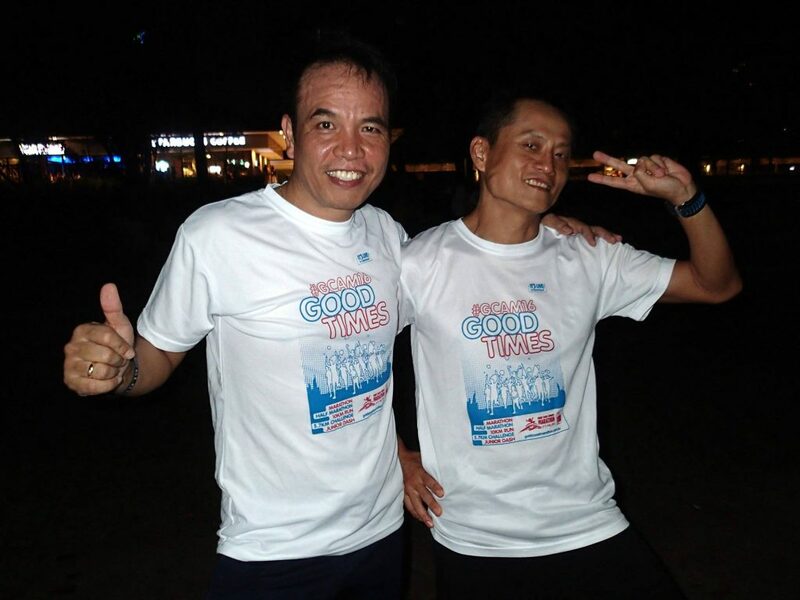 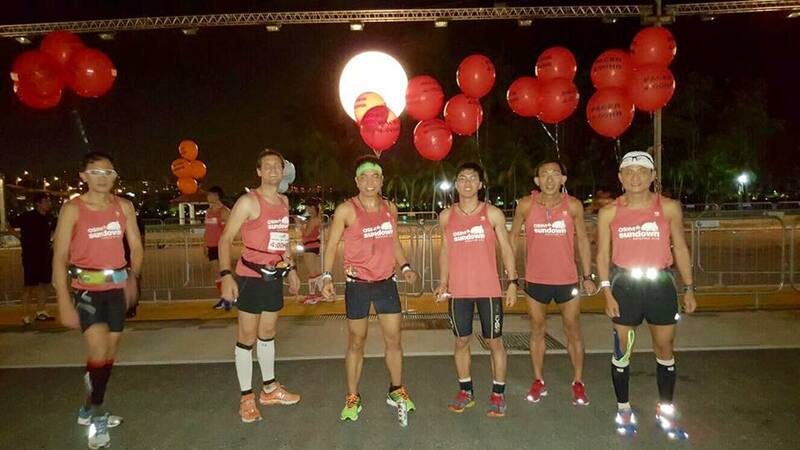 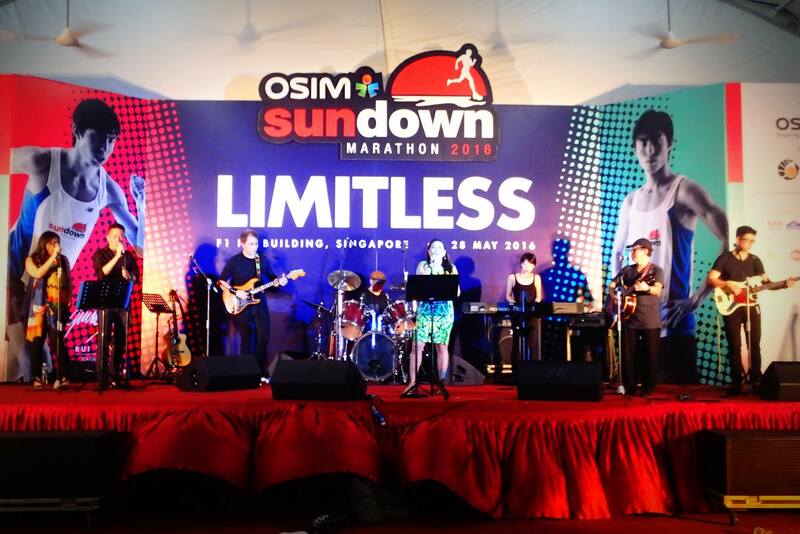 They look all set to perform strongly to beat the night for next week’s Sundown Marathon. 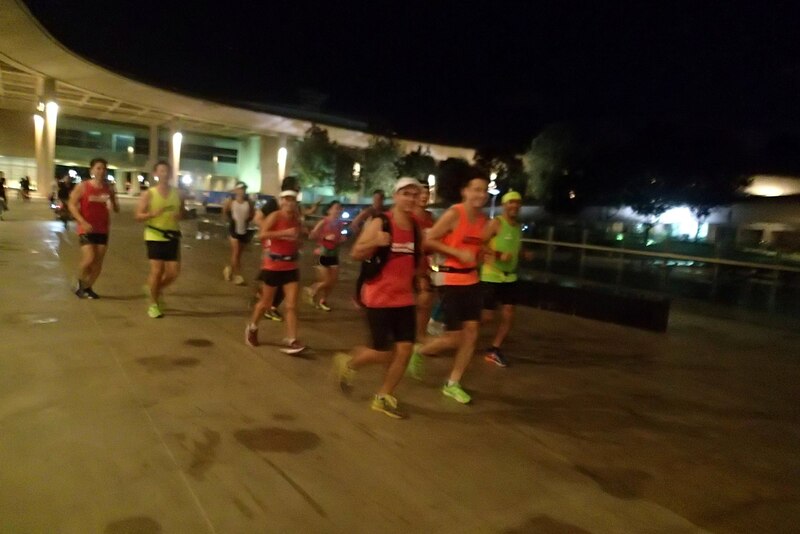 The smaller group of Kookaburras in the respective FM groupings of 4:00h, 4:30h, 5:00h and 5:30h went for the full works of 23km-30km to emerge strongly for the night. 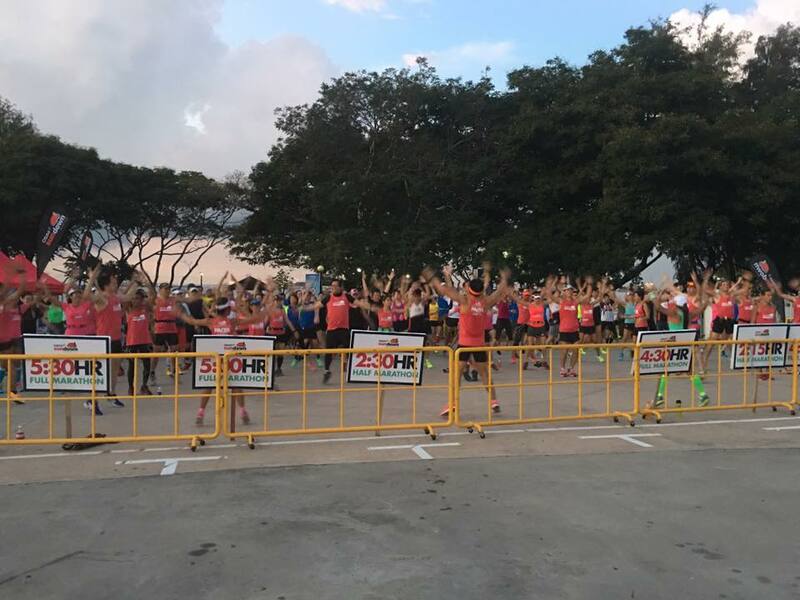 With half of the Kookaburra Program completed, the runners will be looking forward to the final half of the program and their longest runs right after Sundown Marathon, in early June. 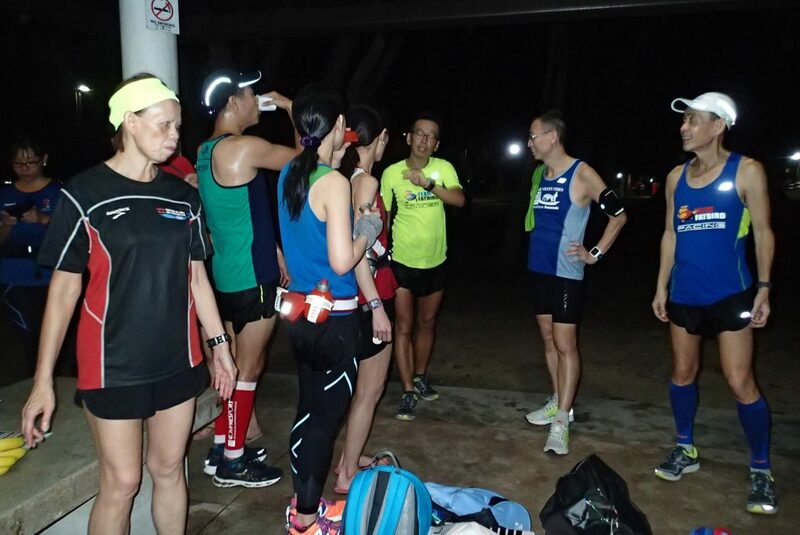 With only 2 weeks to race night, the NightHawks were all charged up for their 15km and 25km Optimal Paced (OP) long run on a Saturday night at Parkland Green. 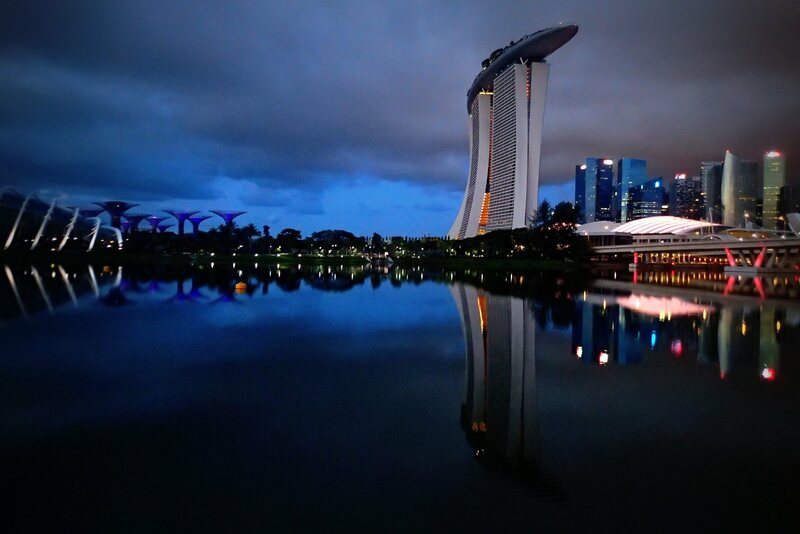 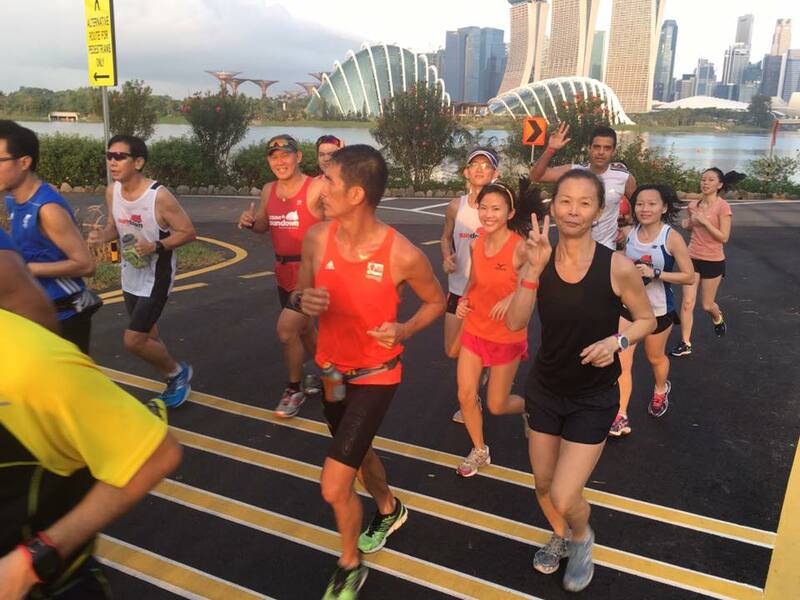 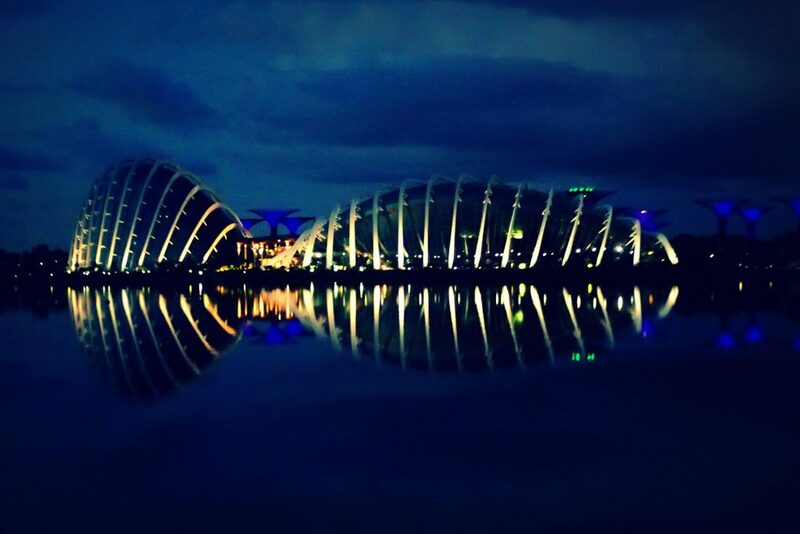 With the race routes and timings finalized, the long training run this evening incorporated the main portions of ECP, Gardens By The Bay and even with the hill loop at the Marina Barrage for good measure. 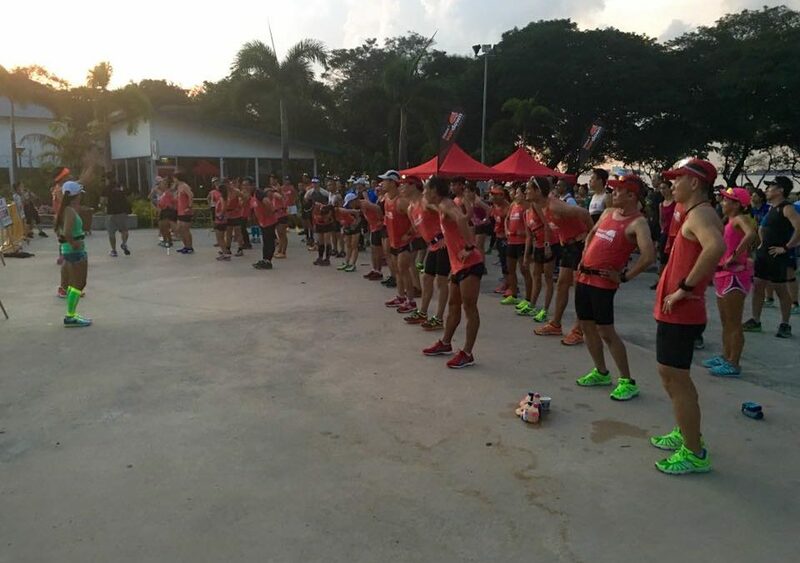 Under the guidance of the NightHawk trainers and Sundown Pacers, the contingent of NightHawks put up their best showing thus far with strength and speed endurance sustained throughout the targeted distances. 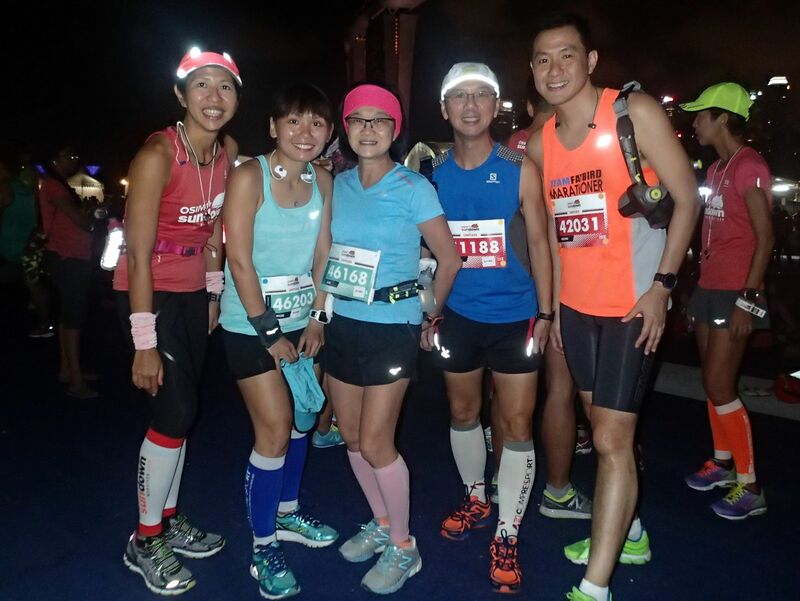 The cool weather (after the bout of afternoon showers) make the run so much easier and enjoyable, and before long, we were already past the midway mark and still raring to go. 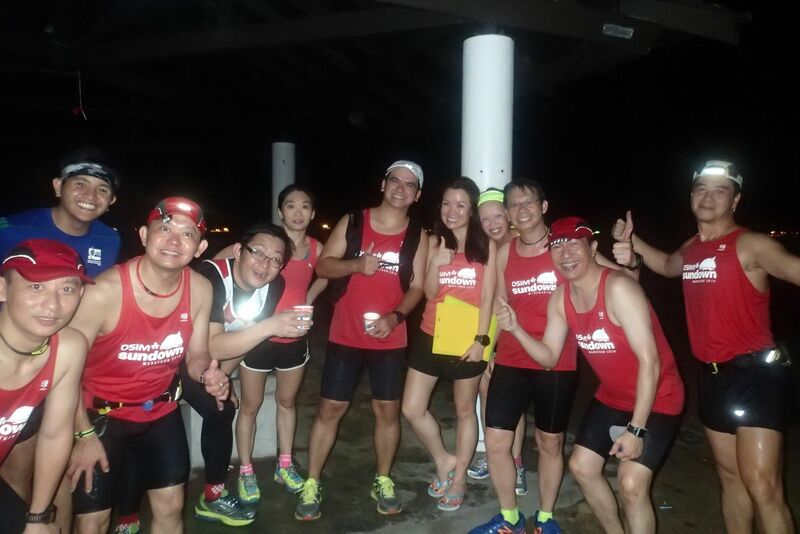 The NightHawks also took the opportunity to test their hydration and fuel plan to make finer adjustments where required. 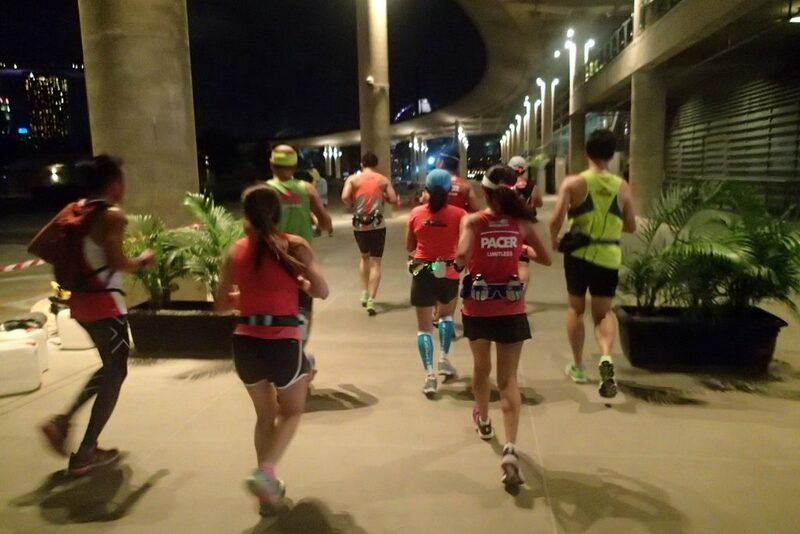 The NightHawks proved to be well conditioned for night long runs, especially after they had progressively built up their mileage and paces with more than 5 runs in the night. 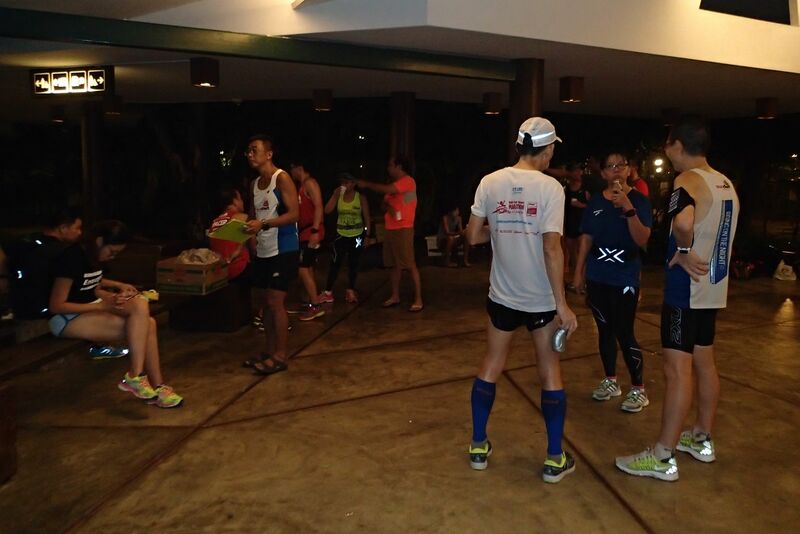 By 10pm, most of the trainees were back at the training area, replenishing fluids and carbs with isotonic drinks and bananas. 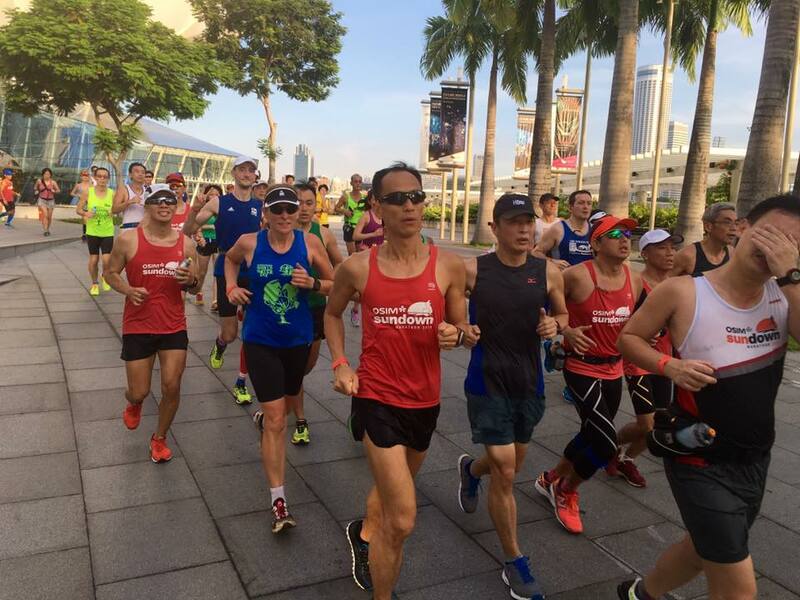 A briefing was conducted with respect to the importance of good nutrition, hydration and rest during the tapering week to maximize performance on race night. 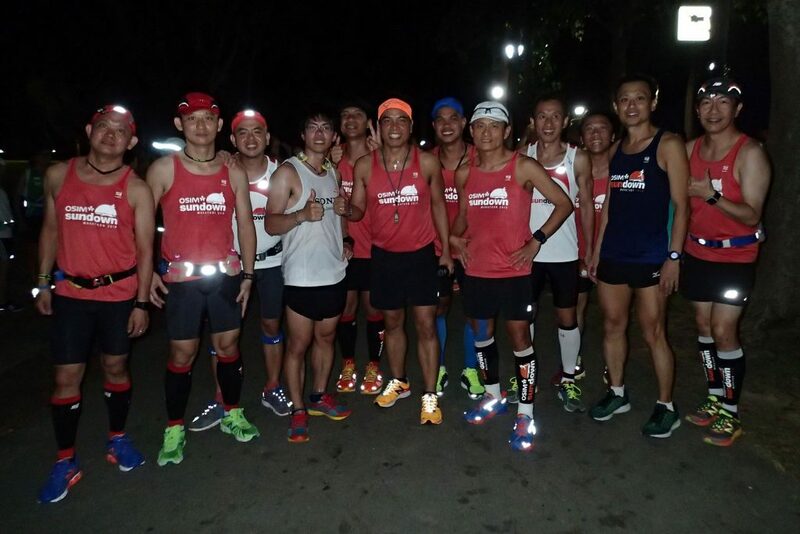 We ended training early and on a high note, with the NightHawks clutching to their just-issued red training singlets, and planning how they will match with race gear and shoes. 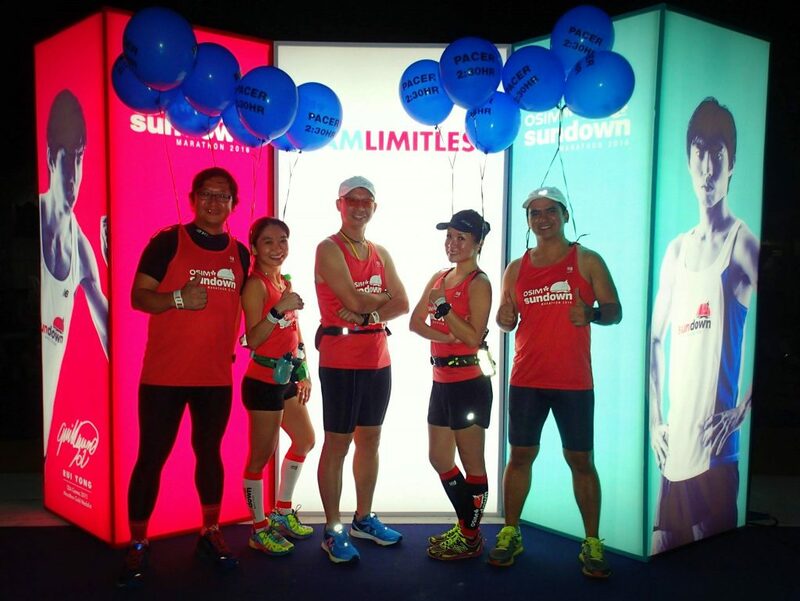 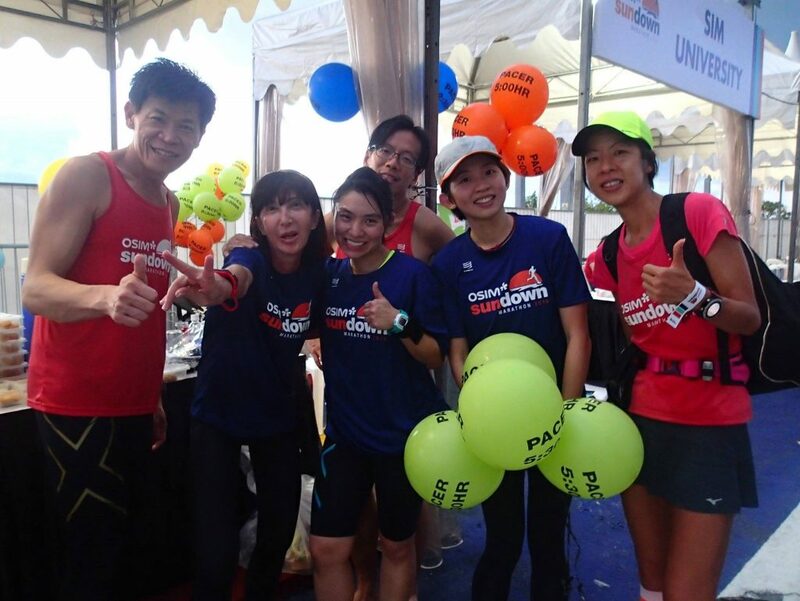 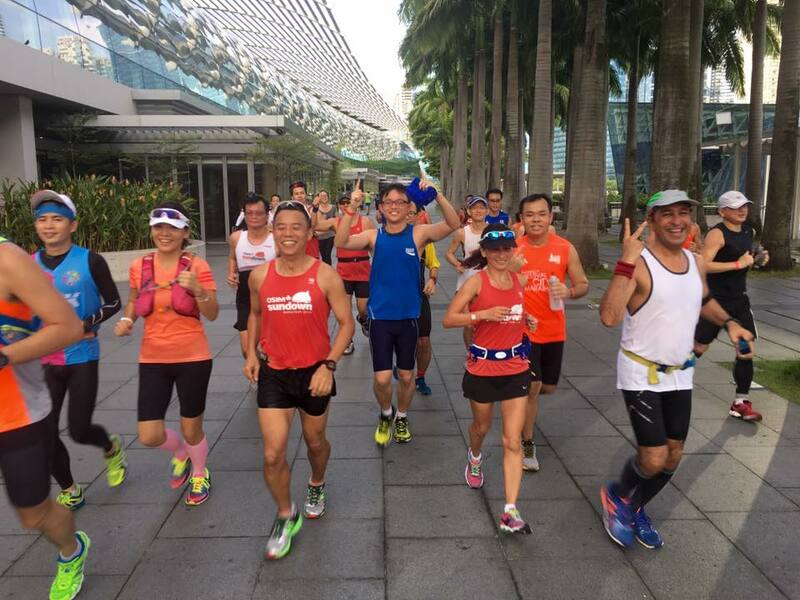 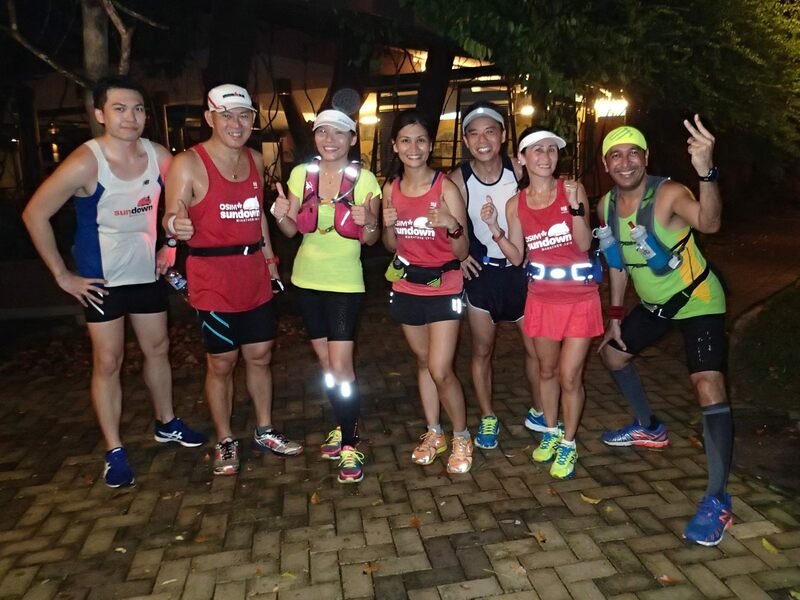 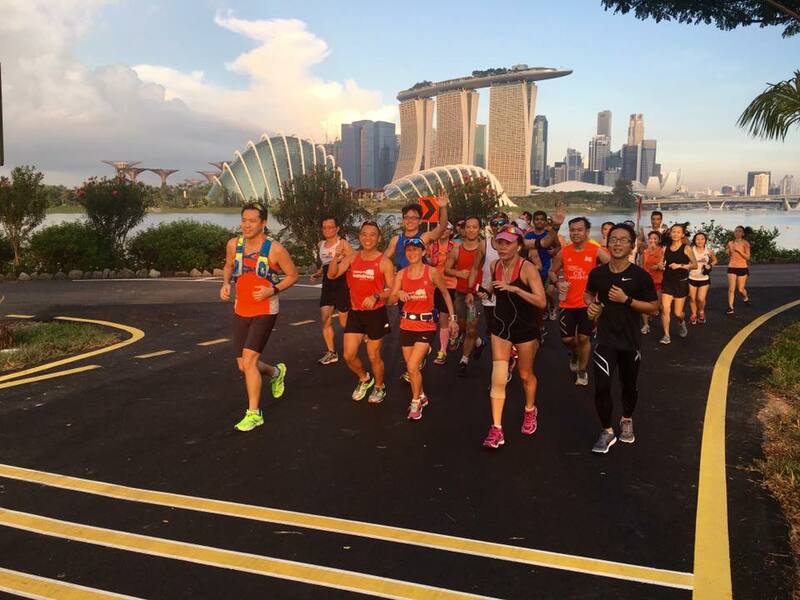 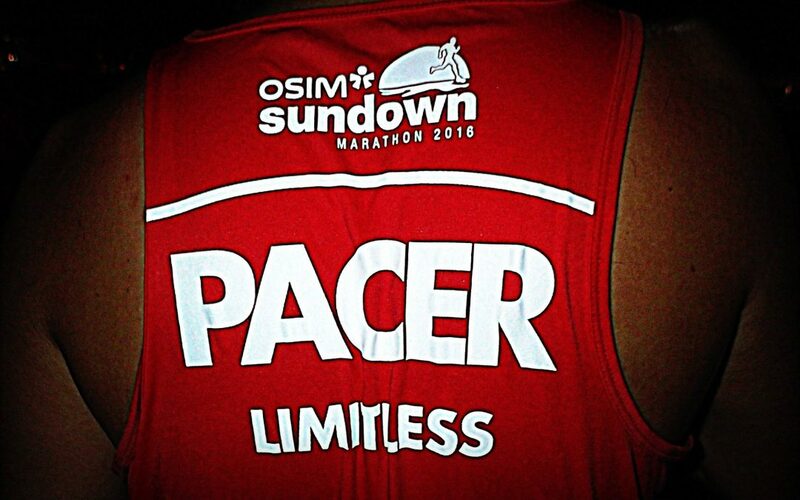 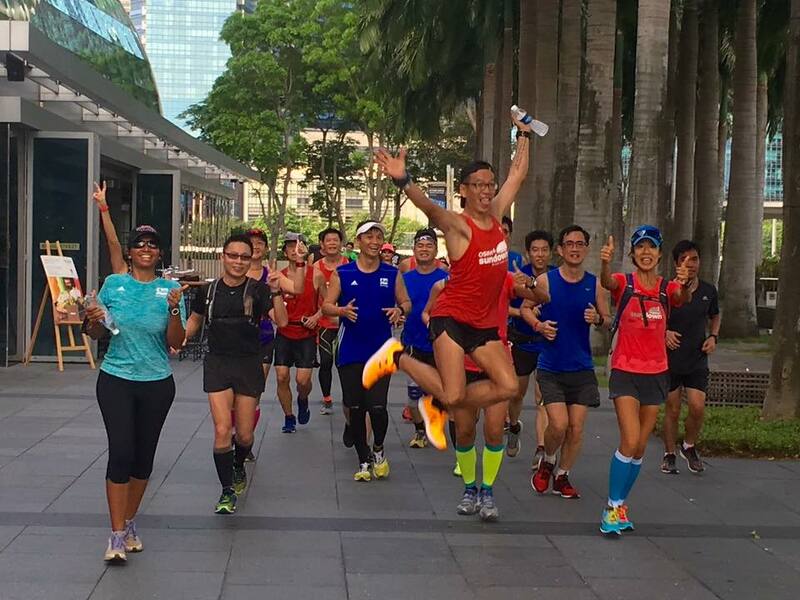 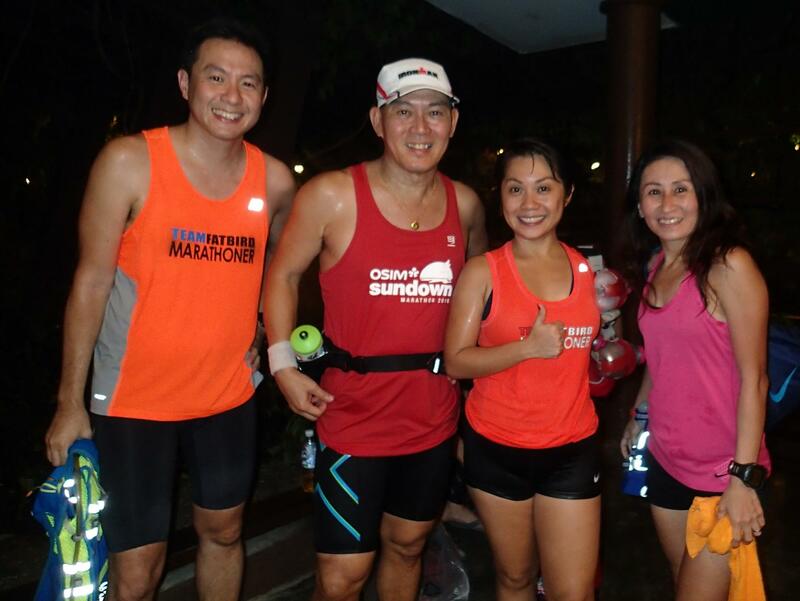 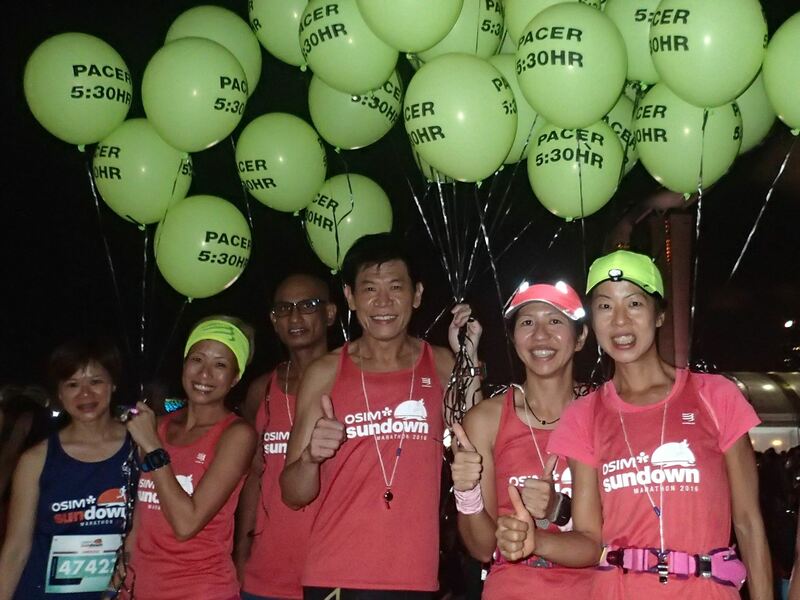 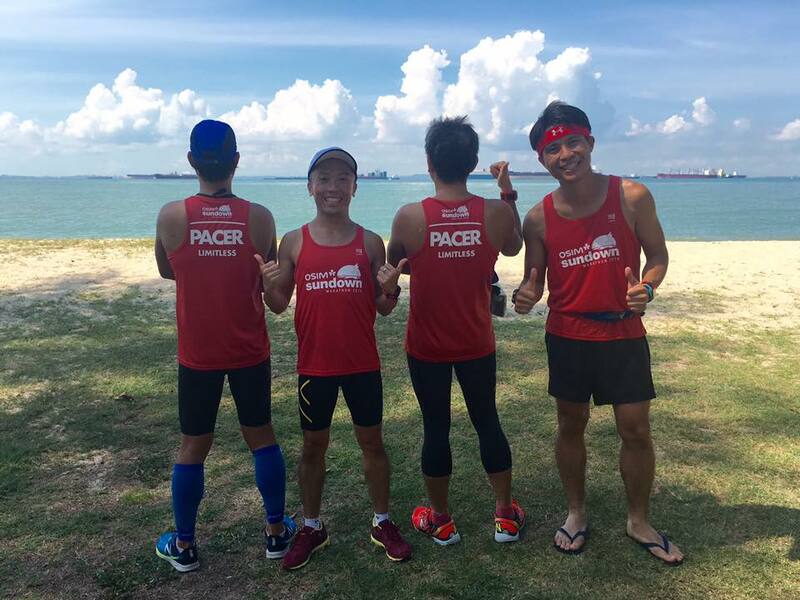 The Sundown Pacers will be at Race Entry Pack Collection (REPC) on May 20-22, and there will be a meet-up on race night for all Sundown Runners as well. 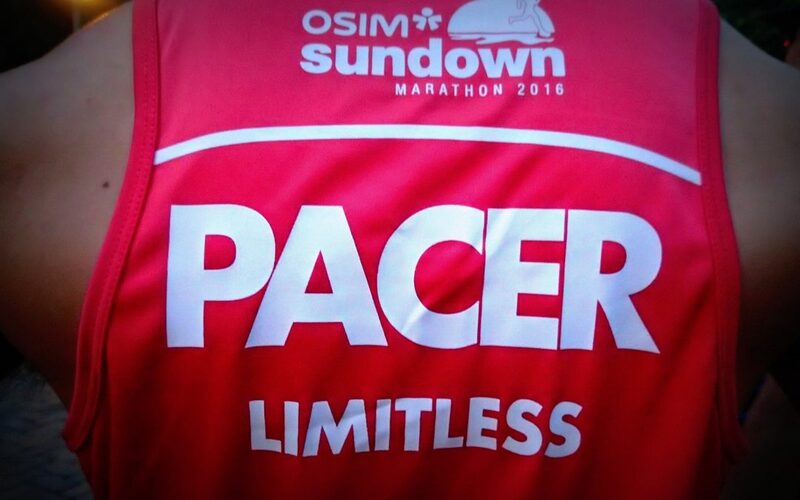 Do visit them and have a chat with your timing group pacers, get your pace bands and possibly get advise on the pace strategy for race night. 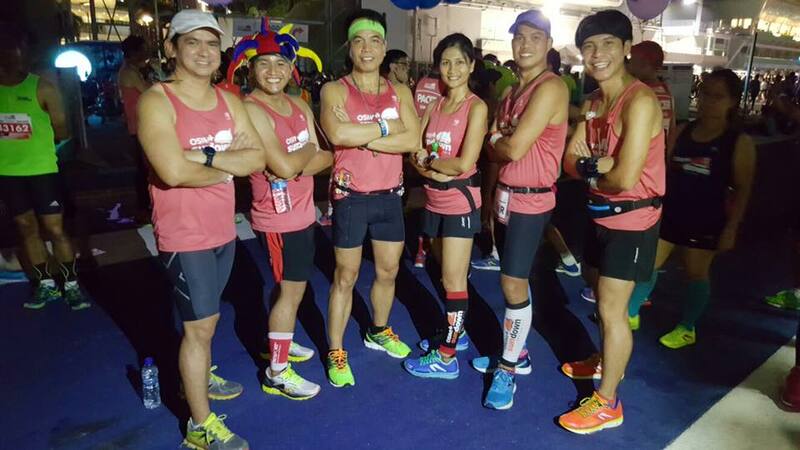 The NightHawks Are Ready To Fly! 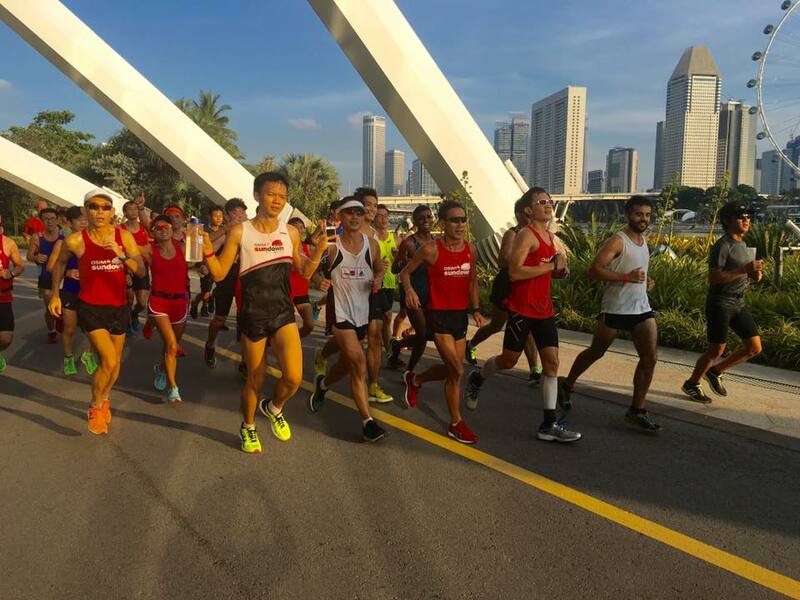 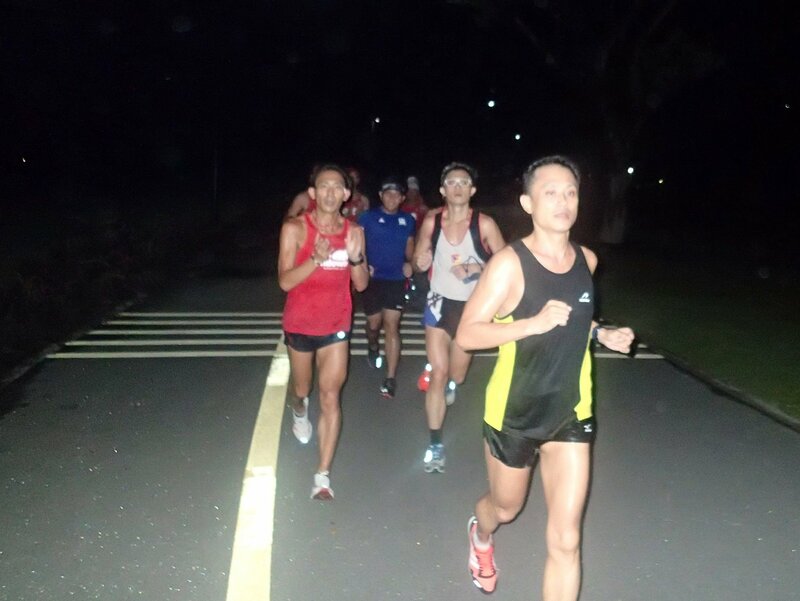 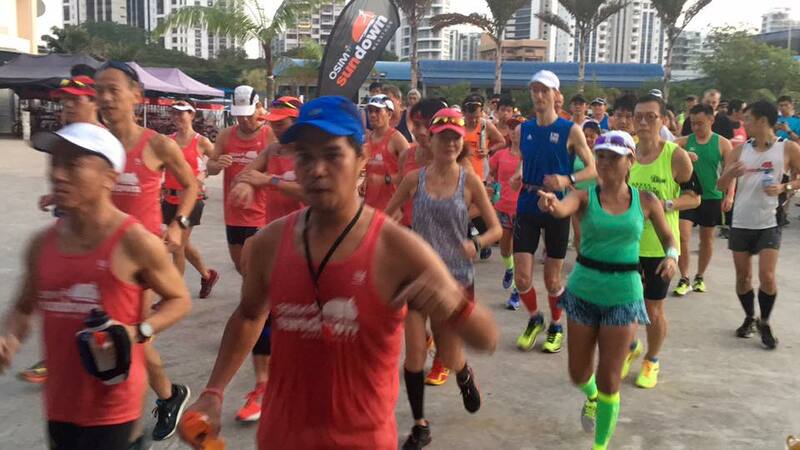 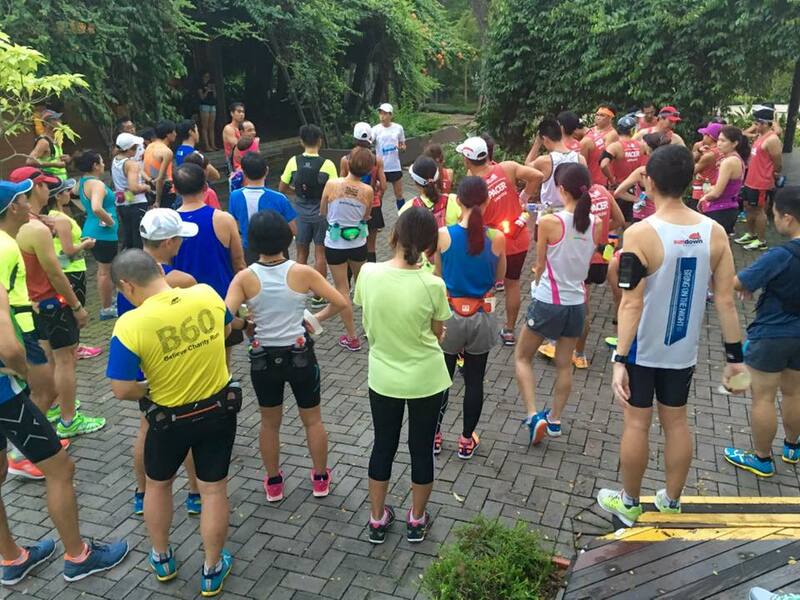 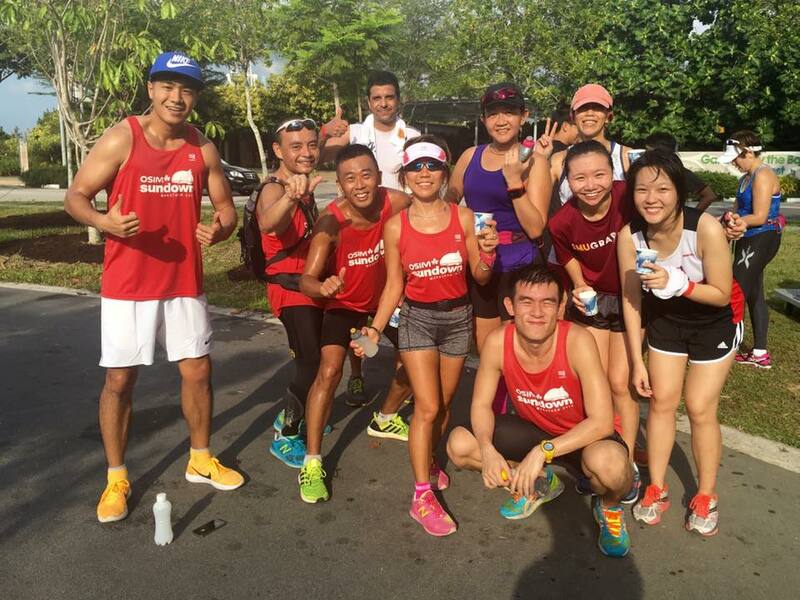 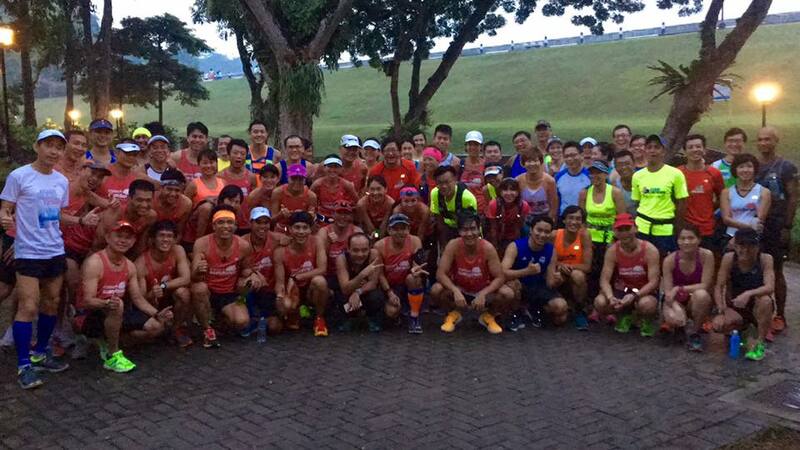 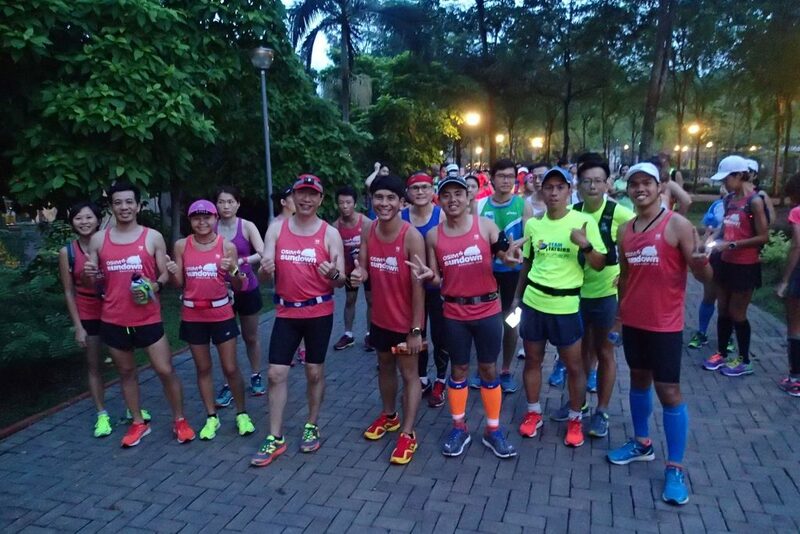 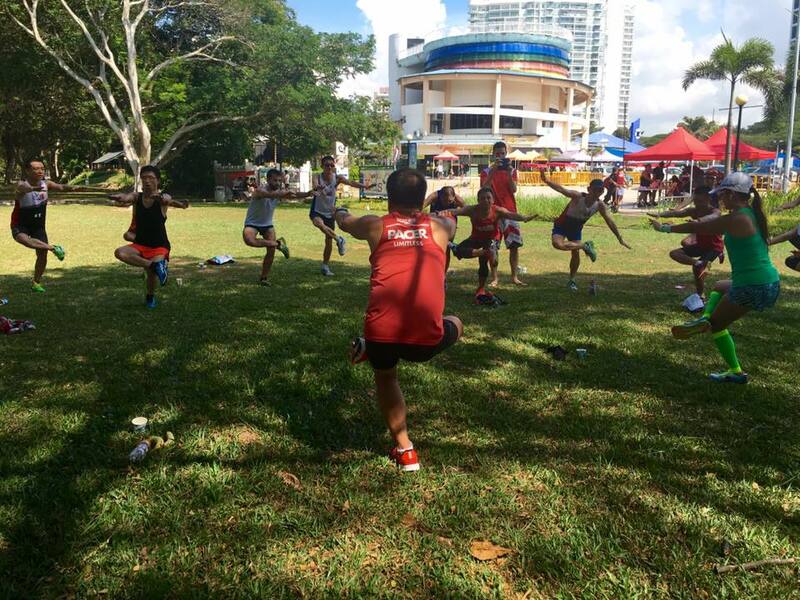 TheKookaburras (Gold Coast Marathon training) and NightHawks (Sundown Marathon training) convened at MacRitchie Reservoir Park (MR) on Saturday evening for their week 9 Optimal Pace training and Week 3 Base Building respectively. 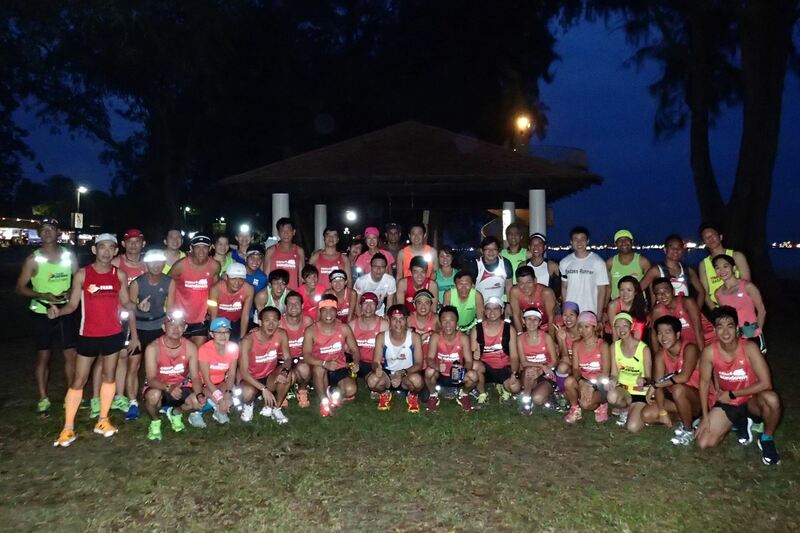 It was to be the longest run for the NightHawks and so we assembled at MR Amenities Centre by 6:30pm. 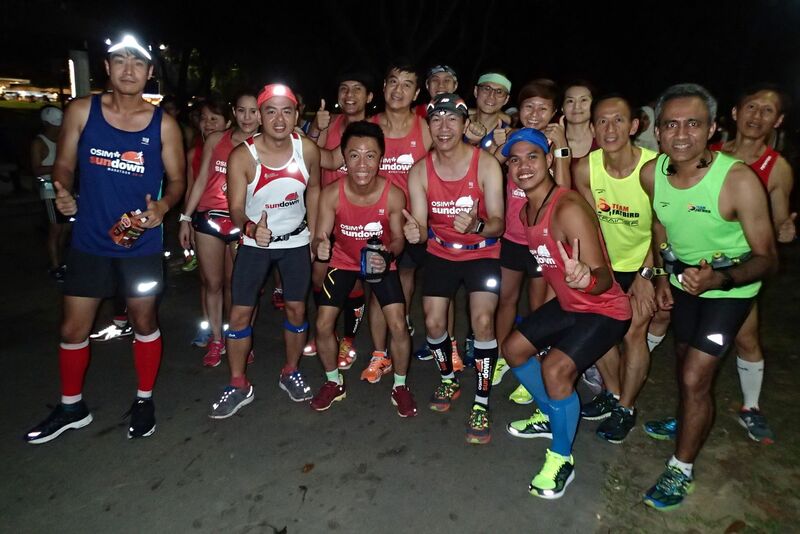 This route traversing the MacRitchie (MR) and Upper Peirce Reservoir (UPR) reserves all the way to the Mandai Zoo has always been the most challenging and interesting every year for our participants training for the Sundown Marathon. 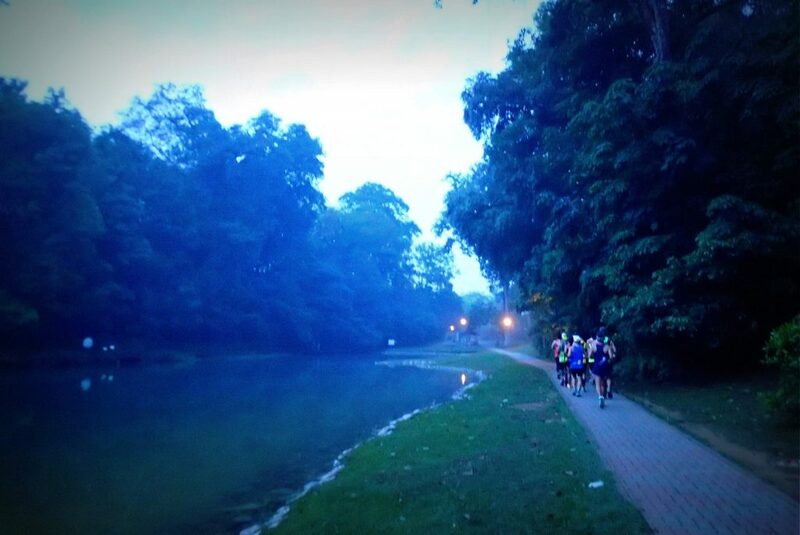 The route is one of ups and downs with winding stretches and also a long PCN flanked by water bodies. 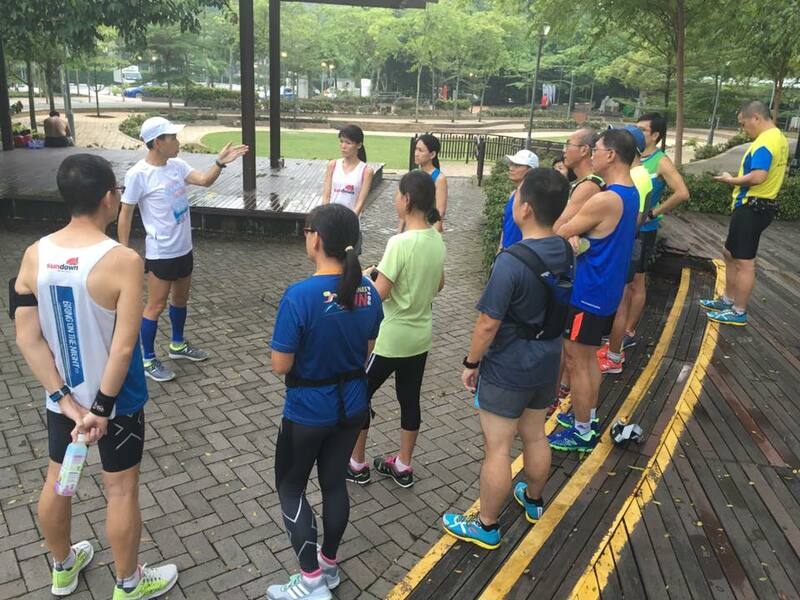 After a bout of afternoon showers, we were treated to cooler weather as we ran towards Upper Thomson Road and then onto Lower Peirce Reservoir. 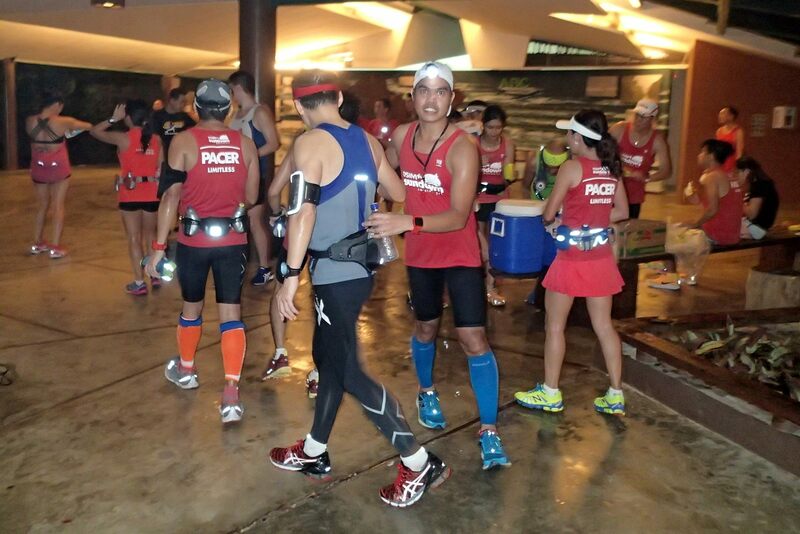 The respective pace groups ran in tight-knit outfits for safety as well as taping on the groups’ energy to see them through the long night. 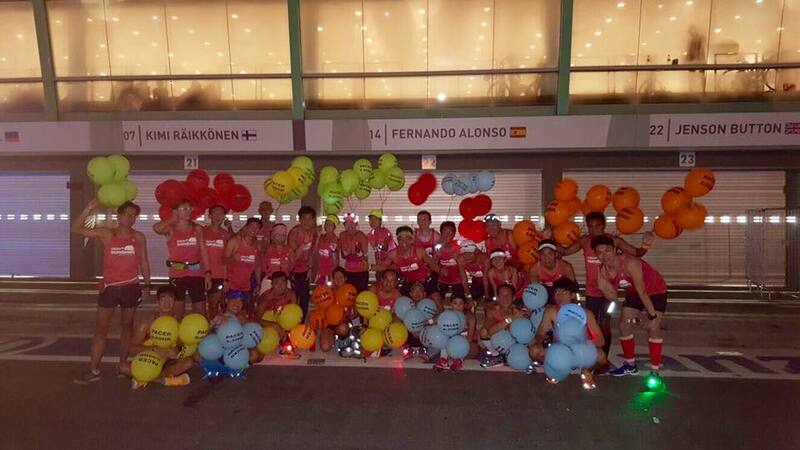 Every year, we would have some trainees who might hit the wall after 25km and would have to take public transport back to the start point, so this time all were ready with some loose pocket change and good hydration on them. 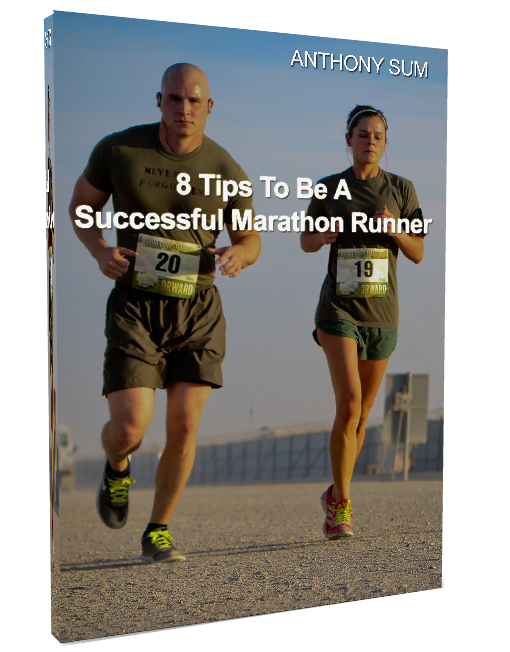 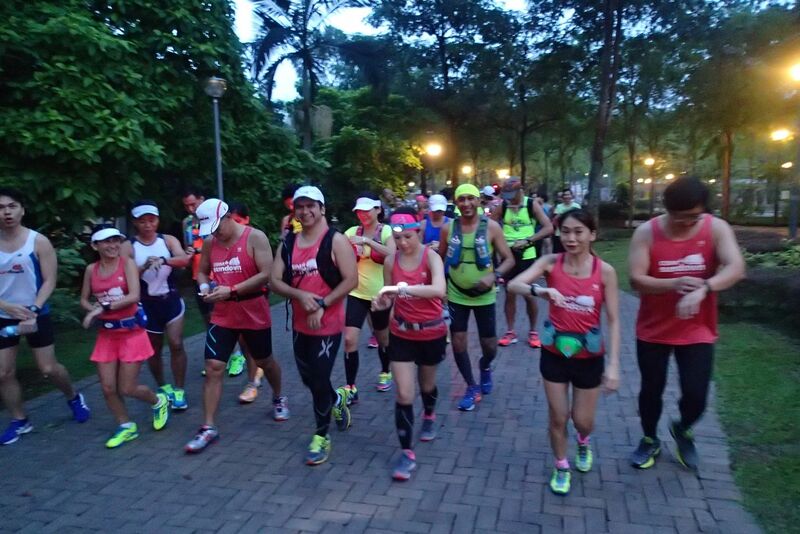 The first half of the run was at easier Marathon Pace (MP) for all to get sufficiently warmed up and into the groove. 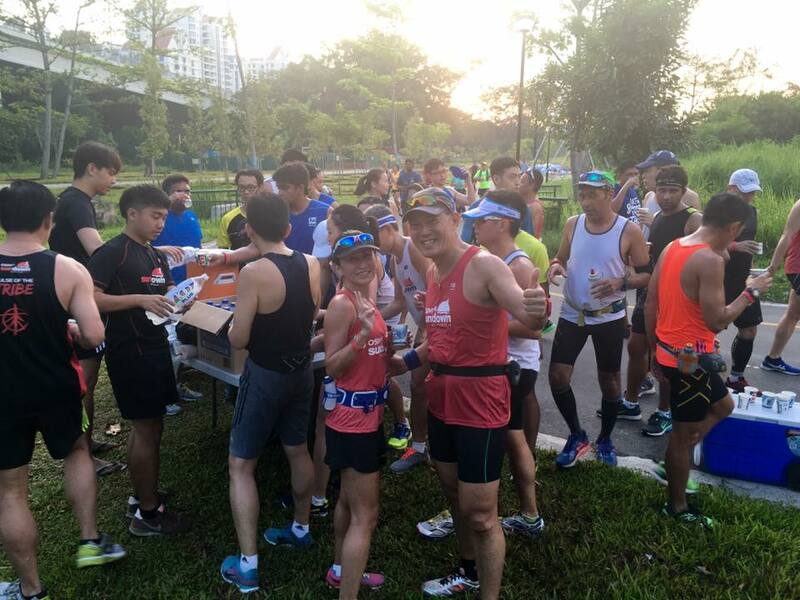 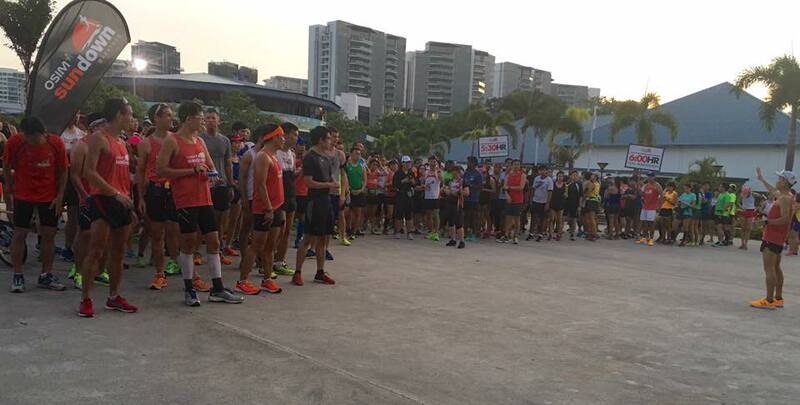 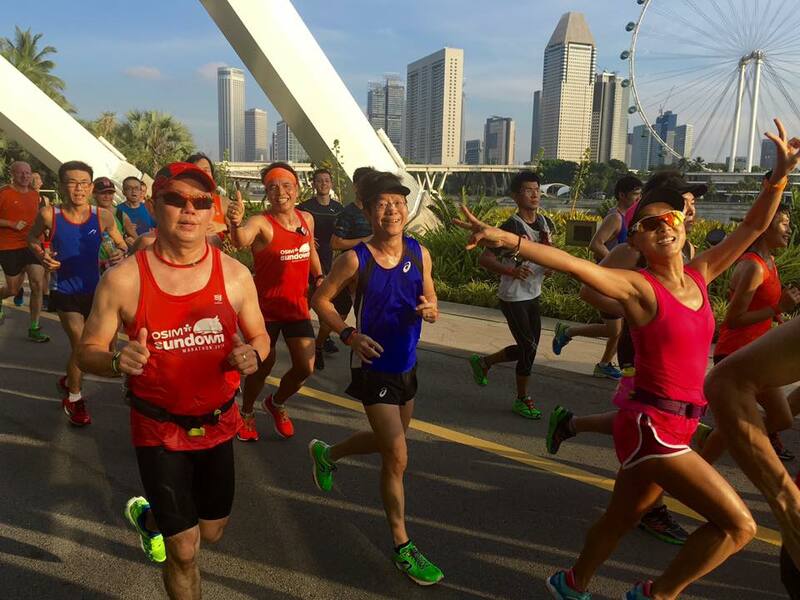 All runners were chatty and feeling strong as the meandered along Old Upper Thomson Road (OUTR) and then onto Sembawang Road towards Mandai Road. 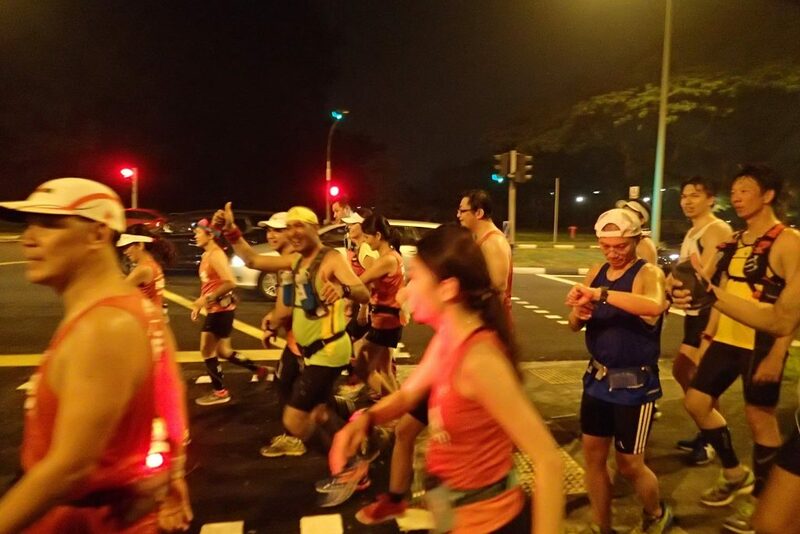 The Half Marathoners turned back at the Mandai Road/Yishun Rd junction for 20km, while the Full Marathoners headed for the Zoo. 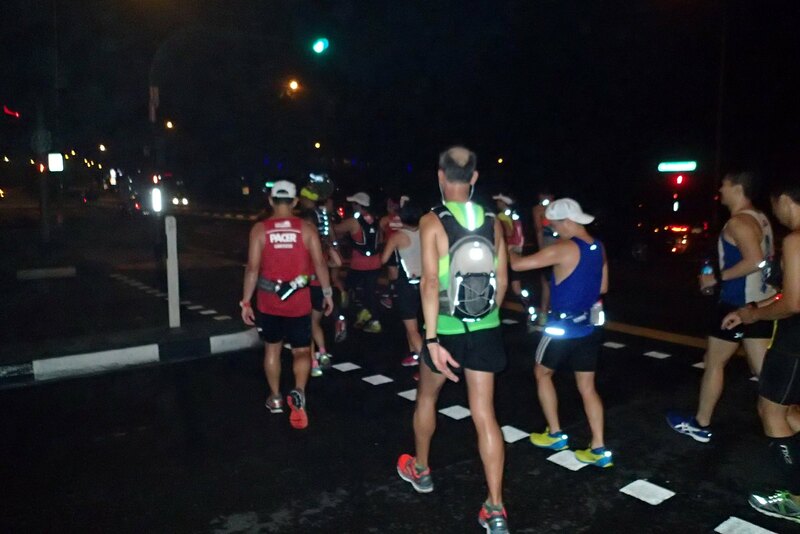 There were areas which were quite dark and runners were reminded to be vigilant and have higher leg-lifts to avoid any trip-ups. Pacers had their blinking lights on to serve as guideposts for the runners, and we mostly ran against the flow of traffic and on pavements where available for safety reasons. 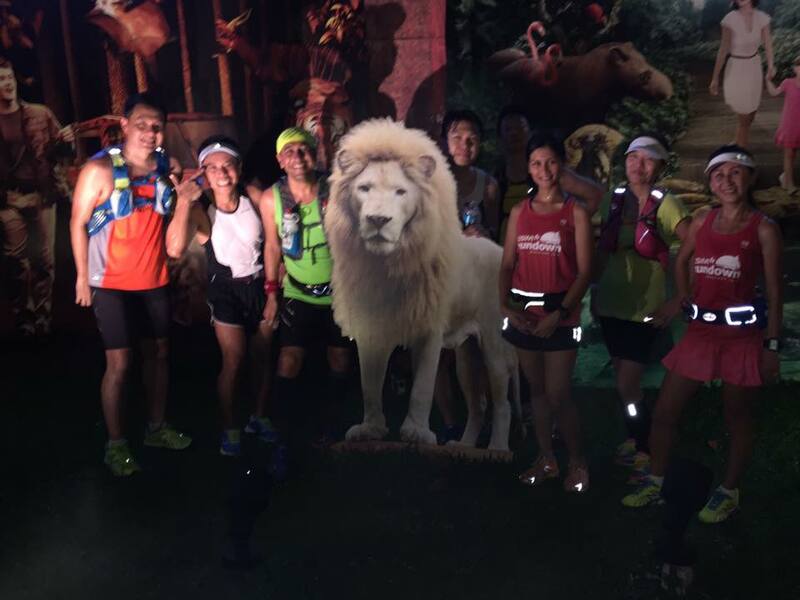 The FMers reached the U-turn point of 17.5km at the Zoo by 9pm before turning back for the say way back. 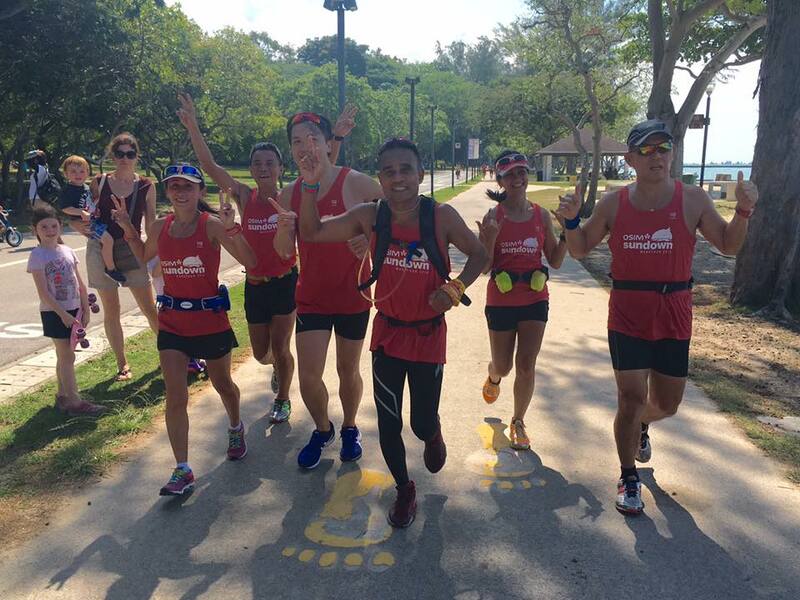 The return trip was faster as we turned up the pace to Optimal for a negative-split attempt and also a transition of pace from MP to OP. 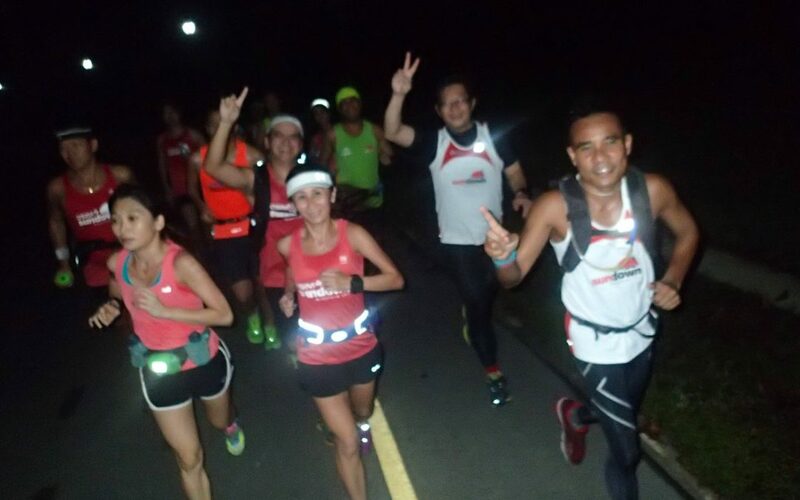 With the string base built up over the last 8 weeks, we were happy to see most of the NightHawks able to maintain the pace, especially in the face of rolling slopes and winding roads. 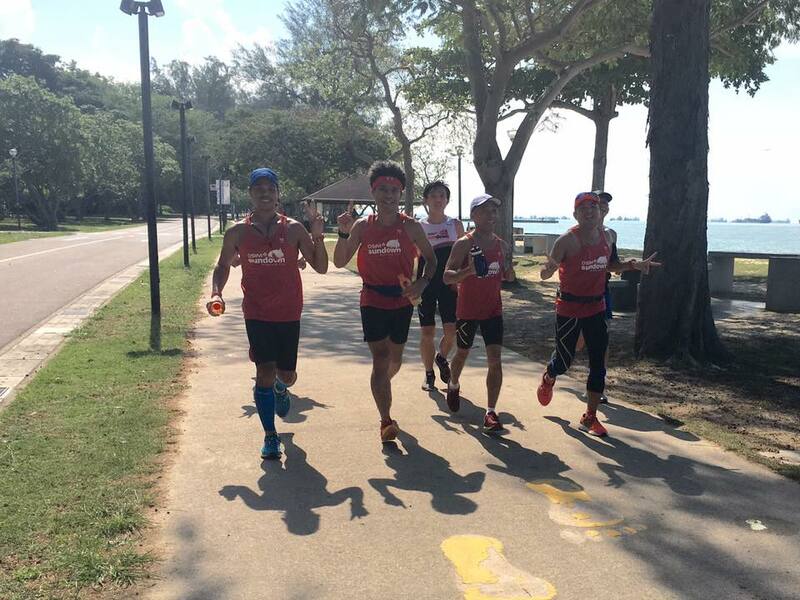 Hydration and fuel plan were put to good use with gels and other carbs intake at various points of 15km, 23km, 30km to have sufficient glycogen to sustain the faster pace. 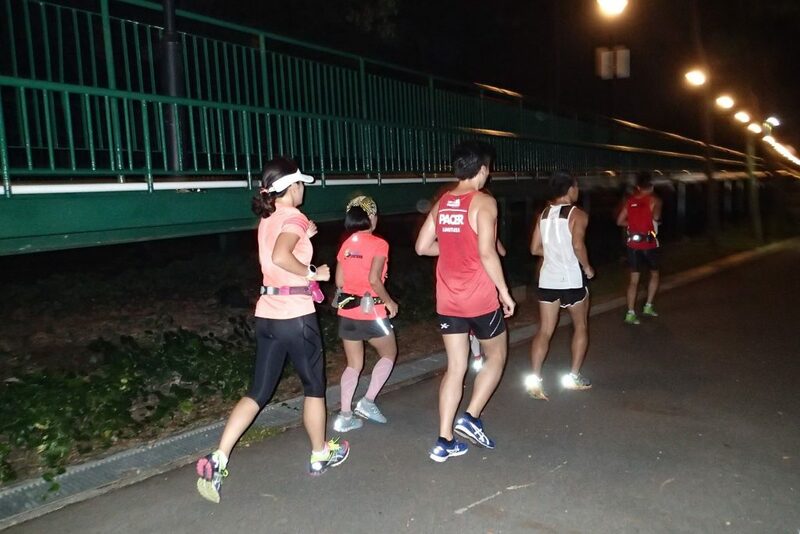 All groups managed a good run to return to the start point by 11:05pm, 5min ahead of the cutoff imposed for safety and injury-avoidance reasons. 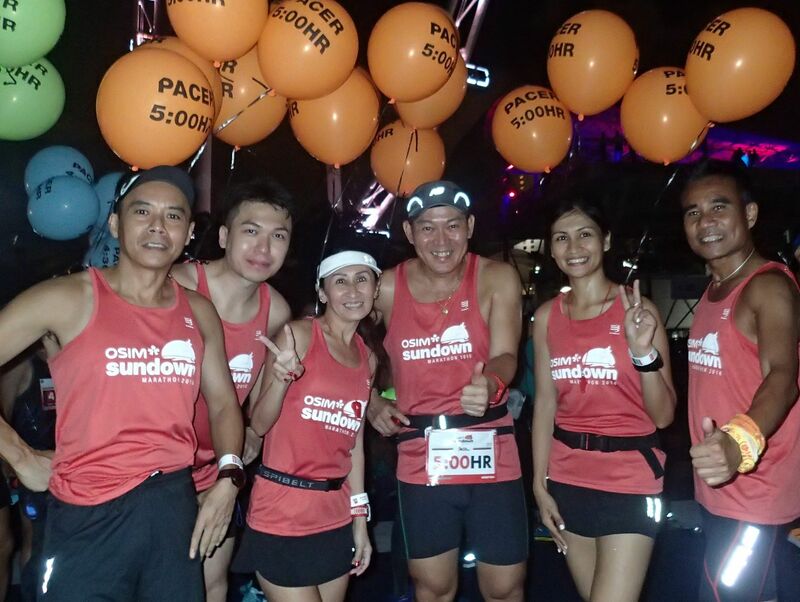 As the various groups completed their runs, there were shouts of “Sundown Runners, Group…We Are The Best!” echoing through the night, evident that the runners still had sufficient reserves in their tanks for that last few km should they be required to add to their run mileage. 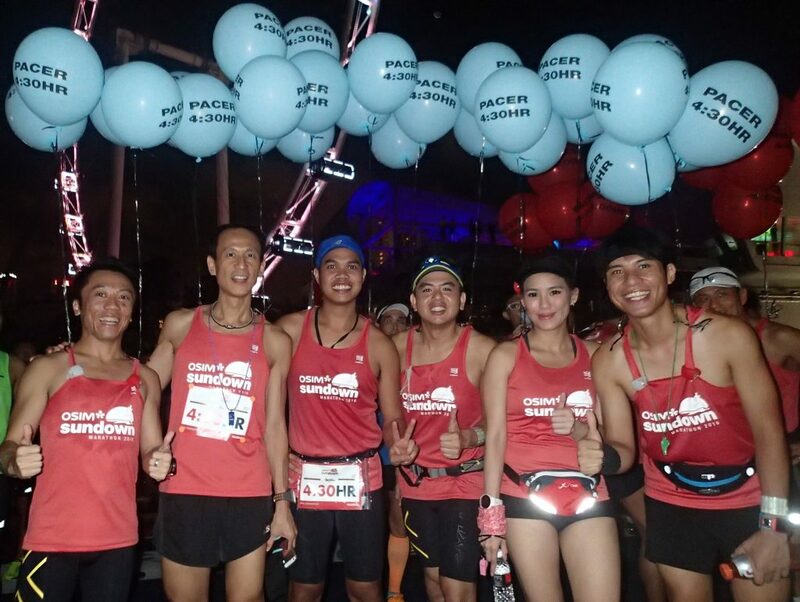 Such is the readiness condition of the NightHawks that they go into tapering mode after next week with full of confidence for a strong night marathon completion on 28-29 May. 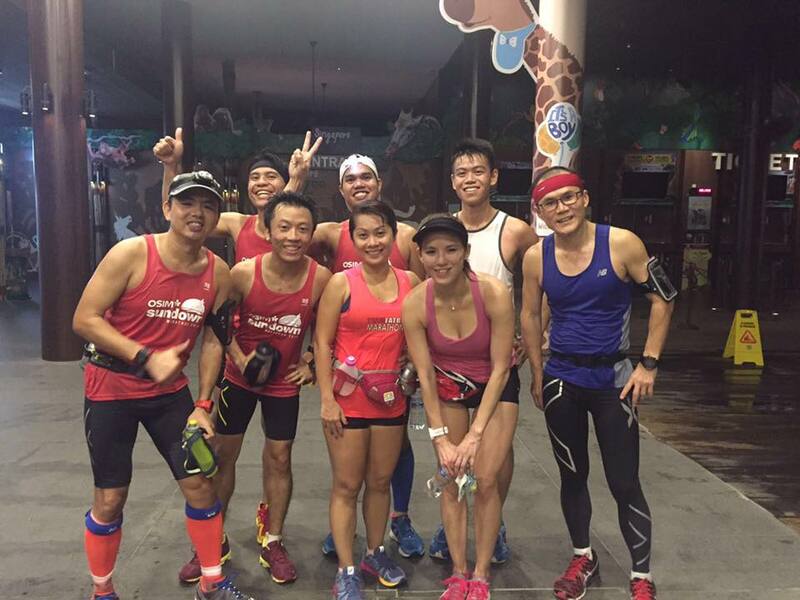 The NightHawks Completed The Longest Run Strong! 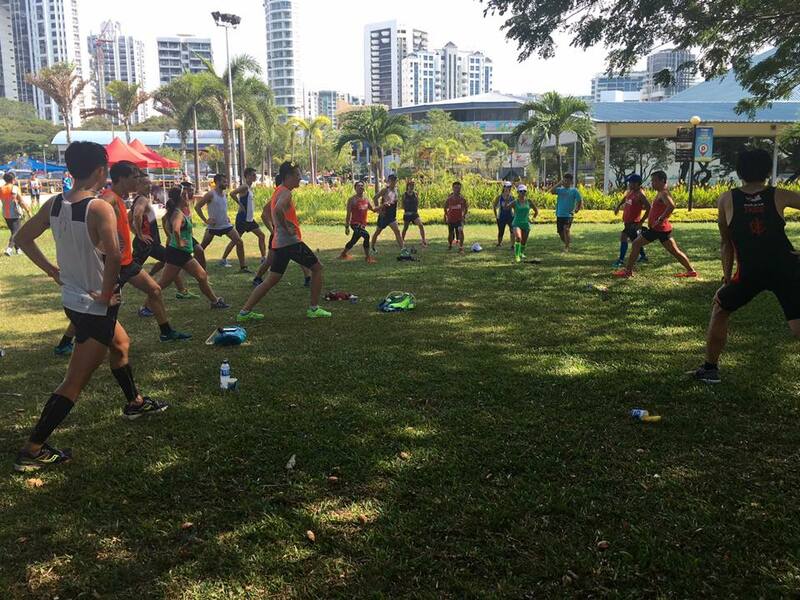 The Kookaburras Are Building Up A Strong Base!